Take it to a HNL on Valentine’s Day! When I was young, it was understood that if you wanted to meet girls you should learn how to play guitar. John Mellencamp said so. But as I matured (hold your applause) I learned that impressing women was a whole ‘nother matter. Women, it turns out, like men who can cook. Well, my guitar wasn’t much use in the kitchen. 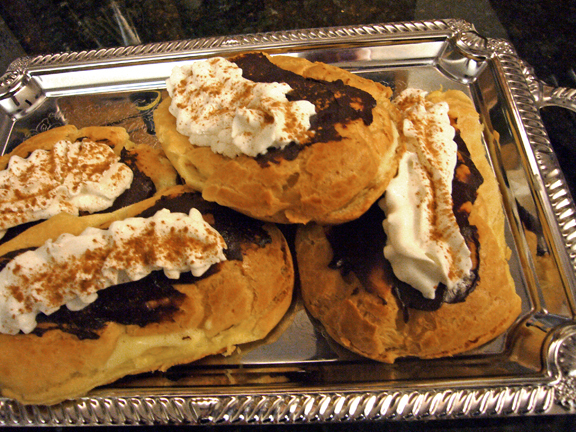 So, I borrowed this recipe for Chocolate Eclairs from Katy (a killer cook) and made them for my date. She was so impressed that she married me. And, although I haven’t made them since. My “First Wife” and I have been married for 20 years, with two ugly kids. So, I thought I’d make them again for Valentine’s day. Try them at your own risk. PS. Relationships are not for the humor-impaired. Form into six oblong baguettes on greased baking sheet. They may seem a little more like pancake batter than bread dough, but they puff up while baking. They’re like popovers and may deflate again too. Bake at 450 for 15 minutes – DO NOT OPEN OVEN. Once cooled, slice the tops off and put pudding inside – you can hollow them out, or use an injector, but nobody complains if you don’t. Chill them in the fridge for 20 minutes – don’t rush here, they taste better chilled. If you like, put whipped cream on top, and sprinkle on a little chocolate powder, or my favorite, some ground nutmeg. Eclairs are my ultimate favorite dessert! Thanks so much for sharing this easy version! 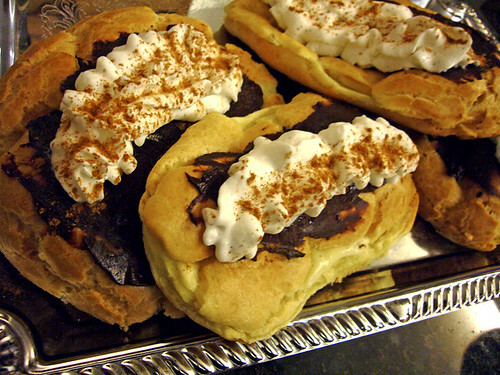 I LOVE these Chocolate Eclairs! Aaaawww what a sweet guy, great love story! The eclairs look and sound superb. They are one of my favorite pastries. They look delicious!! Emma wants to try them this weekend….Emma read the story and wanted to know if that really was the reason Aunt Kori married you?